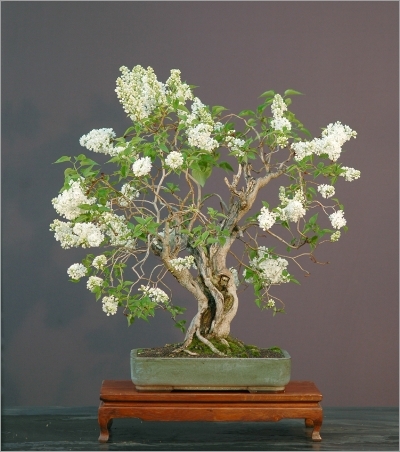 Syringa vulgaris is originary from Europe. Great bonsai tree potential. If left to grow naturally, it reaches 8 to 10 feet tall. A small tree that with age develops deeply furrowed bark. This species of Lilac produces suckers new shoots that sprout from the base of the shrub, or from the roots. 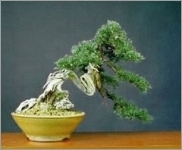 Is very tolerant of hard pruning necessary for bonsai cultivation. Green heart-shaped leaves are smooth and appear before the flowers bloom. At Fall, the leaves turn yellow-green. The light purple flowers grow in large clusters, from May to June and have one of the most powerful fragrances emitted by a plant.